This was NOT the pattern and tutorial I planned to publish this week. I have a fun pendant necklace project and quickie Halloween bunting tutorial that I’ve been working on, but this is one of those project ideas that refused to be ignored. I went to Michael’s in search of a specific decoration for the small friends’ classroom Halloween party, and came home instead with all the materials for this project. Despite my best efforts to convince myself I really did not have the time, my hands independently added a black t-shirt, 2 foam sheets, and white acrylic paint to my basket. Does that ever happen to you? 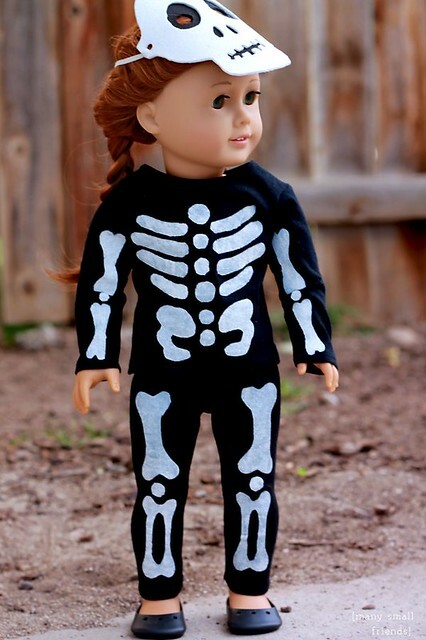 Here’s what you’ll need to make your 18 inch doll her very own skeleton costume. Don’t worry, it’s really fun, easy, and fairly quick (the most time consuming step is literally waiting for paint to dry)! 1/3 yard of black knit fabric -or- 1 black t-shirt to cut up. White paint and foam or stipple brush used for stenciling. I used inexpensive acrylic paint and a foam brush. White and black foam sheets -or- white and black felt. A few inches of elastic -or- ribbon -or- yarn for the mask. Sewing machine, iron, and coordinating thread. Glue. I used Alene’s Tacky Glue. Tape or pins to adhere your paper Bone templates to your fabric. You will also need a few patterns, all of which are FREE! From the Scientific Seamstress: Pattern for the long sleeved top. Be sure to download the patterns to your hard drive and print at “Actual Size” from a PDF reader like Adobe Reader. If you print directly from your browser, the patterns may not print at the correct scale. A note about the Scientific Seamstress pattern. I have been aware of this free pattern for years and it is readily Google-able, but I could not find where the Scientific Seamstress. Carla, has posted about this pattern on her website. I would prefer to link to the pattern via her site, but since I couldn’t find the proper page, I linked directly to the download link which I found via Google. I do want to give her a MAJOR shout out, as I have enjoyed her patterns for years, and if you are not familiar with her work, check her out at The Scientific Seamstress. 1. Cut the pieces for the long sleeved top and pants from your fabric. 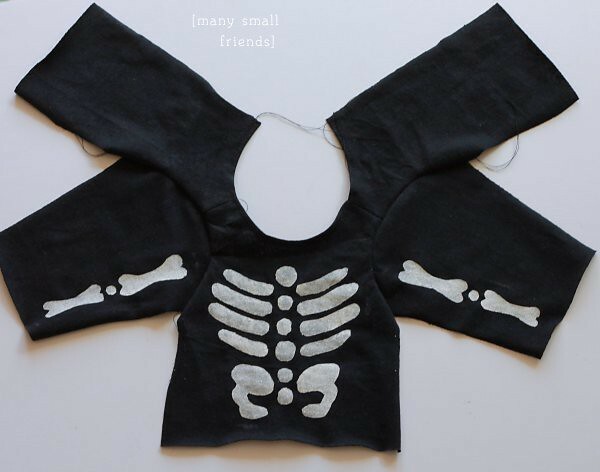 **IMPORTANT – Add about 1/2 inch length to the bottom of the long sleeved t-shirt Front and Back pattern pieces so that the painted Bones will all fit. 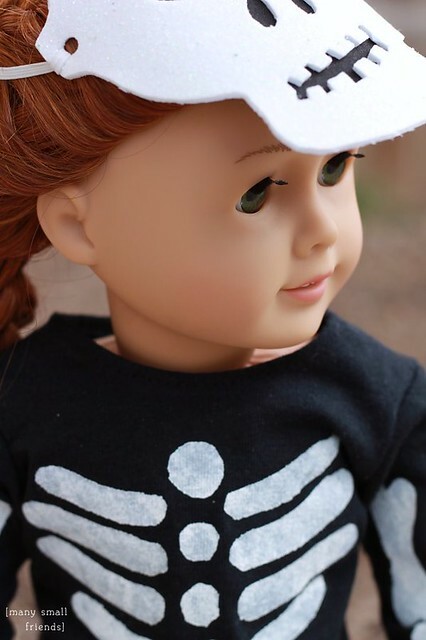 TIPS – I love cutting up t-shirts for doll clothes because I can use the pre-made hems! 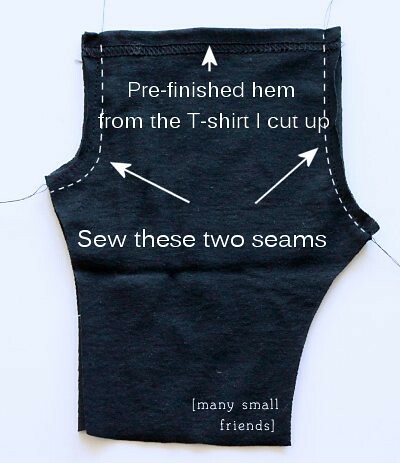 Align your doll t-shirt pieces and pants pieces along the hems when you cut and save yourself lots of work. This is particularly useful for the top of the Skeleton Pants. 2. Cut apart the paper Bones pattern on the dotted lines. Separate the chest piece, the two arm pieces, and the two leg pieces. 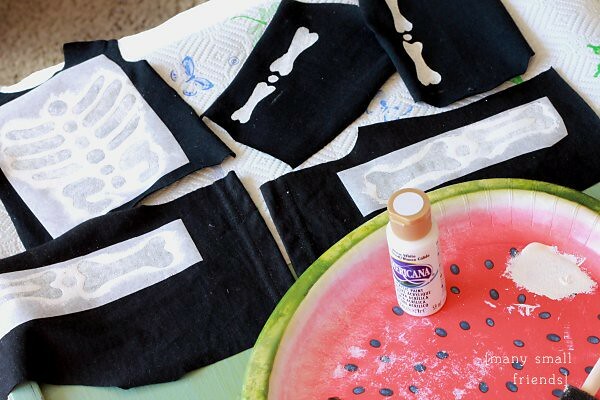 Carefully cut out the Bones, creating a template for you to paint the Bones onto your fabric. Tape or pin the paper template pieces to your fabric, aligning as shown. Note that the Arm Bones and Leg Bones are NOT aligned in the center of the sleeve and pant leg pieces, but are shifted off center. This is very important for the correct positioning of the Bone designs on your finished costume. TIP – Trace the paper templates and cut the bone designs from freezer paper or fusible embroidery stabilizer. 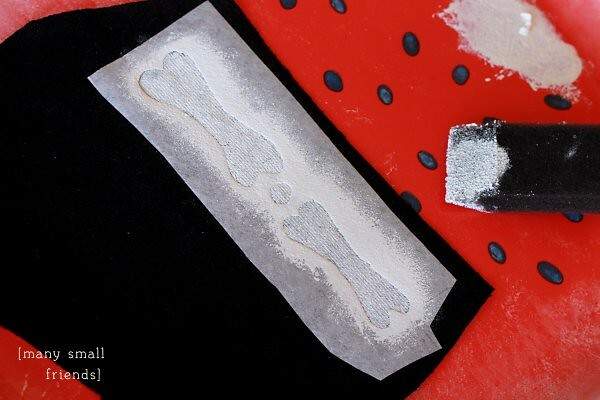 Then, you can iron the freezer paper or stabilizer templates directly onto your fabric, paint, then peel off the templates after the paint dries. This makes your painted edges very crisp and also ensures that your templates won’t slip around as you paint. 3. Paint your Bones on the fabric pieces. I used inexpensive white acrylic paint. Use a foam sponge or stipple brush to apply the paint, in an up and down vertical “stamping” motion, rather then side to side strokes. This will help to keep the paint within the boundaries of the paper templates and keep the edges of your design nice and crisp. Avoid overloading your brush with paint, a little bit goes a long way! It’s better to do multiple thin coats, letting each coat dry between the next coat, if you want a thicker paint application. I found one coat of acrylic paint to be just right. Be sure to paint on a washable surface or with scrap paper behind your fabric, as some paint may bleed through the fabric. TIP – Practice painting on scrap fabric before you begin! Allow paint to dry thoroughly before you continue. I waited about 4 hours. Check the label on your paint for recommended dry times. You can skip ahead and make the Skeleton Mask while you wait! When your paint is dry, remove your paper templates and admire your work. Refer to the instructions that accompany the pattern download. Be sure to position your sleeves correctly so that the Bones will be on the front of the arms and not the back! 5. 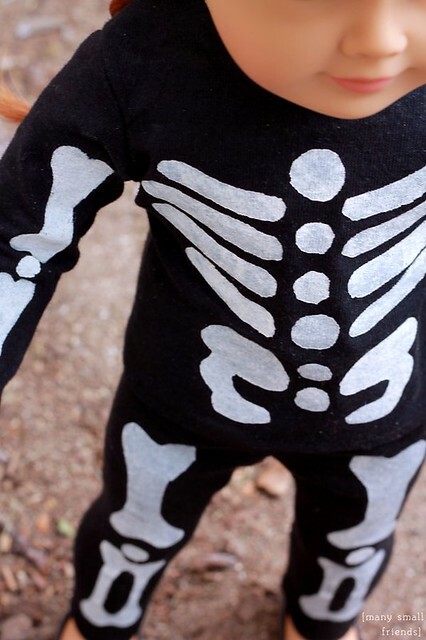 Sew your Skeleton Pants. With right (painted) sides together sew the front and back seams. If you did not use the hem of a t-shirt for the top edge of the pants, fold and iron a 1/2 inch hem and sew. 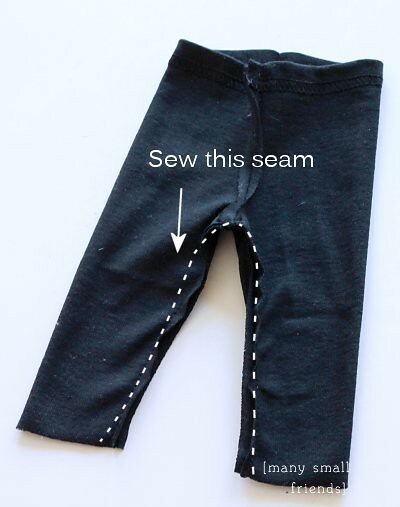 There is no need to insert an elastic waistband, the stretch of the knit will hold the pants in place. You can turn up a 1/4 hem on the pant legs at this point, or leave the edges raw. Don’t feel guilty if you decide to leave the pant legs unhemmed. Knit edges won’t unravel, and it is after all, a costume! After hemming the pant legs (or not), bring front and back center seams together, align the legs and crotch, and sew. Your Skeleton Pants are done! 6. Make your Skeleton Mask. Trace and cut the mask pattern from white foam or white felt. Cut out the eyes, nose holes, and mouth. You can stop here, or you can glue black foam or felt to the back of the mask to make the eyes, nose, and mouth areas black and appear “empty” looking. I backed my mask with black foam and cut holes in the eye “sockets” just large enough for my doll’s eyes to peer through. Punch holes in the sides of the mask and thread elastic, ribbon, or yarn through the holes. I used elastic and tied a knot at each side. That’s it, your Skeleton Costume is done! Easy peasy lemon squeezy. 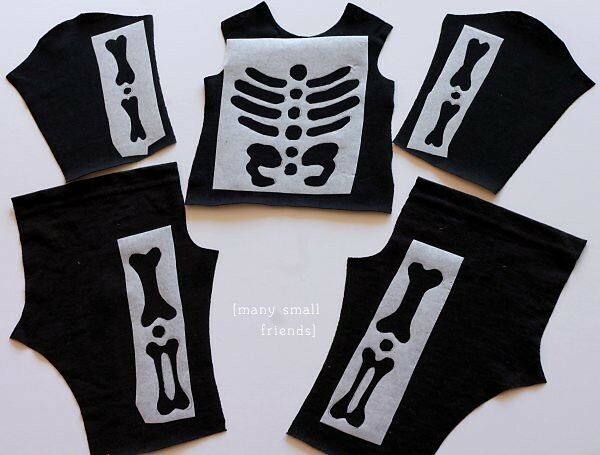 If you’d rather not paint on the Bones, you could use the pattern to cut Bones from white felt and sew them on the costume or fuse them on with a fusible web like Steam-a-Seam or Stitch Witchery. This entry was posted in Doll Sewing, Dolly Holiday, Free Doll Patterns and Tutorials and tagged 18" Dolls, American Girl Dolls, Doll Tutorial, Dolly Holiday, Free Doll Pattern, Sewing for Dolls. Adorable! I’m with you on the pre-finished hems, I discovered this over the summer while using a freebie pattern from Pixie Faire and loved it. I’ve even used up sleeves for this reason, you can get a lot of fabric out of a t-shirt. Plus, I don’t know about where you are at, but knit fabric is not only hard to find sometimes, but very expensive too. Yes! The price is no small factor, especially if you are using recycled tees. I bought this tee new (although came home to find *two* black tees already in my stash. Le Sigh) for $3 at Michaels. I probably could have purchased 1/3 yard of new black knit for $3, but it wouldn’t have had the lovely pre-hemmed bits and the ribbing on the neckline. Plus, it’s much more then 1/3 yard, so plenty of leftovers to use on other projects. This is super cute! What a great project for our tweens that have outgrown the princess phase! 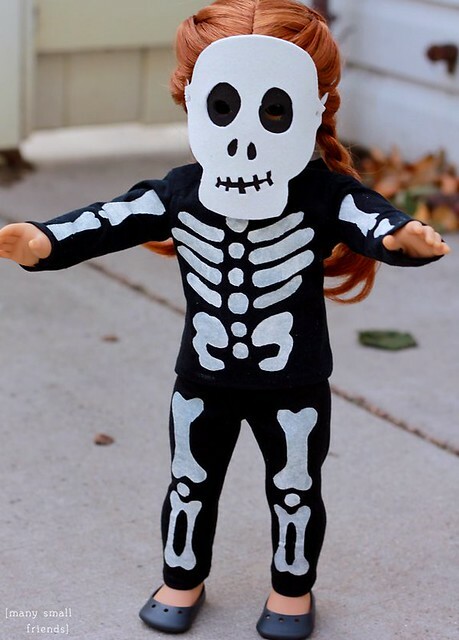 If I had time, I would have given it a try… but I have to sew my real kids Halloween costumes first! I still have an 11 year old’s costume to make, but luckily it’s mostly just alterations to thrift store clothes. He’s going to be one of the Doctors Who. 😉 My daughter’s costume is store bought this year, but she has several orders in for costumes for her dolls! Ah! Bowties! And Fezzes! How fun. A few years ago a friend’s son went as the fourth doctor, not sure where she found it, but he had one super long scarf with it.